On Sept 17, 1886, St Gemma's saintly mother Aurelia died, leaving her Father Enrico to raise the family alone. Gemma was only 8 years old when her mother died. Gemma’s father Enrico had been carrying on a very successful business as a Chemist (Pharmacist) when, suddenly, his affairs took a bad turn. He had always been generous, most free in giving away money, and had allowed his daughter to become a mother to the poor. It was a common saying that all he had slipped through his fingers like sand. Himself a perfect pattern of moral integrity in business transactions, he trusted implicitly in the honesty of others. He lent money to various people and unwisely stood security for others. The failure of rents from his lands, the long sickness and death of his wife and two children had greatly reduced his resources. One by one the bills which he had signed fell due and all his property, movable and immovable, was seized by the creditors, so that both he and his family were thrown into utter destitution. Soon after, he fell seriously ill with cancer of the throat. Gemma, who had just gotten over her own sickness which included painful foot surgery (without an anaesthetic), was frequently by his bedside, animating, consoling, and preparing him to receive the last Sacra­ments. He died at the age of 57 on November 11, 1897, leaving her a penniless orphan. "We entered on the year 1897, I alone, without heart [she used these words to hide what in her was heroic virtue], remained unmoved by so many misfortunes. That which most grieved the others [note: the others, not herself] after Papa's fatal illness, was to be left without means. I understood one morning the greatness of the sacrifice that Jesus required at once, and I shed many tears. 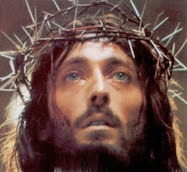 But Jesus, during those days of sorrow, made Himself all the more sensibly present in my soul; and even from seeing Papa so resigned to die, I drew such strength that I bore this bitter separation with great tranquillity. The day he died, Jesus forbade me to give way to useless grief, and I spent it in prayer, fully resigned to the most Holy Will of God, who then became my earthly and heavenly Father. After Papa's death on November 11, 1897, we were left without anything, and had not even the means of supporting life. We had only enough to live on. One of my aunts, realizing this, helped us a great deal. She was unwilling that I should remain with my family. So the day after my father's death she sent for me and had me stay with her for several months." In the many writings of Gemma, we usually find her opening her heart, and sharing her thoughts and difficulties in a most tender and beautiful sincerity. But, in speaking of the death of her father, she does not lay open to us the secret feelings of her heart. He was only fifty-seven when he died, and left behind him three sons and three daughters, penniless and orphaned. But a scene occurred which even Gemma could never forget. Scarcely had her father closed his eyes when the creditors in large numbers rushed in upon the little group to close the pharmacy, to seize what little furniture still remained, and to search even Gemma's own pockets, taking away the few small coins they found in her purse. The scene made such a lasting and painful impression upon her mind that, during the mental agonies and wanderings of her last illness, she saw over again these pitiless oppressors of the poor searching her home, and laying hands on all they could find, regardless of the death that was within those walls. Justina Giannini on her side deposed that the Galgani family was so badly off that often they had nothing to eat, and that it was said that collections were made throughout the city for these poor people who had once known ease and comfort, and who in consequence were ashamed to beg and thus make their poverty known. According to Elisa Galgani this state of affairs lasted a long time. 'We had nothing. The Court and the creditors took all. In the beginning we depended upon the charity of the good, but afterwards Guido got a position as chemist at the City Hospital.' Gemma, however, was not appalled by the poverty to which she and her family were reduced, because she considered poverty and the sorrows of life as precious gifts from God-as an ignored inheritance reserved by Him for the elect. ‘This is the state of life God desired for us,' she often said to the family, and was content thus to fulfil the will of God. 'And not only did she love to be poor,' continued her aunt, ' but she encouraged us to love it also. And at this time we were in want even of necessaries!' According to her own account she tried to bear the heaviest burdens that arose from this state of affairs and to alleviate the sufferings which the others endured as a result of their poverty. 'No matter how small it was,' said Elisa Galgani, ' Gemma always reserved the smallest portion for herself.' And another witness declared that she ate very little in order to have more to give to her brothers. ‘In these sad circumstances Gemma found a means of exciting even myself to have confidence in the Providence of God. She used to say to me: "Say the Rosary of five decades with these words: 'Providence of God, have mercy on me.' When you have said that ten times, add: 'Providence of God, You have provided for me,' or, 'Providence of God, You will provide.' "
Gemma also expressed the same sentiments to her Aunt Elisa, ' Have patience, have patience, God will provide.' And God always did provide. To one of a character different from Gemma's own this sudden fall of the family into utter poverty, at an age when she most needed the help of its reputation and support, might well have been a source of discouragement. Was this the reward of her virtues, her prayers and Communions? But Gemma had trained herself to see in all things the Divine Will, and courageously faced the future trusting in God's Providence that was to her "an anchor of the soul sure and firm." Nor did she trust in the kindness of Providence in vain. Carolina Lencioni, an aunt who was in relatively good financial circumstances, invited Gemma to reside with her in Camaiore, a village not far from Lucca. And Jesus, who had chosen this child for Himself, was knocking at the door of her soul filling it with an ever increasing abundance of graces and extraordinary favors. "Whenever I went out," she says in her autobiography, "I asked papa to give me some money, and if, as sometimes was the case, he refused, I had at least bread and clothes to give away. It was God's will I should meet these poor people, and every time I went out I encountered some three or four of them. To those who called at the house I gave clothing or whatever I could lay my hands on, until I was forbidden by the confessor to do so. But a day came when papa gave me no more money, nor was I allowed to take anything from the house, yet every time I went out I seemed to meet none but those who were in distress. They all ran to me and I had nothing to give. I wept with grief and resolved to go out no more." And so the poor and unemployed have in St Gemma a most compassionate and understanding friend and Saint who can certainly sympathise with their sufferings, having experienced such sufferings and trials herself. For those interested, there is another article here which goes into more detail about the time in Gemma's life when she and her family were very poor, even to the extent of having no food whatsoever to eat. -St Gemma, pray for us! Poor, homeless & unemployable, I pray every day for Help to deal with & overcome my disabilities so I can help others who are worse off than I. So every Sunday I buy breakfast for one person who looks destitute & hungry. It seems so little but it does that person some good. I always wish them a blessed Sunday & remind them that God loves them. As I leave them eating I remember that God loves me too & I feel blessed as well. Thank you Saint Gemma for giving me support & love. Thank You, Blessed Jesus for feeding the poor & loving us sinners. Please give us the Living Water & feed us with the Bread of Life. Thank you so much for your inspiring comments. You are truly living the Gospel and setting an example for all of us who read your message. I offer my poor prayers that God may strengthen and help you to overcome your disabilities, so that, as you say, you might better be able to help others who are worse off than you. Yes, St Gemma is an excellent Saint to pray to for those who are unemployed, because Gemma herself was unemployed and very poor throughout her life. As you probaly read, when her father died, she and her brothers and sisters were left penniless, and when the debtors came right after her fathers death to confiscate the contents of her house, they literally took the loose change that was in Gemma's pocket, which hurt her deeply, and the loss of all their posessions caused her great suffering and pain. And so Saint Gemma is an excellent friend and advocate of those who are unemployed, having suffered such difficulties herself for many years. I pray that God may bless you and your loved ones, and may Saint Gemma obtain the grace of a new job for you. -St Gemma, pray for us! Thank you for your comments. I pray that St Gemma may always be with you, and may she help you materially and spiritually. Dear Glenn - I have thoroughly enjoyed reading all about St Gemma. Thank you so much for this site! I stumbled upon this site searching for the patron saint of back pain - my husband has suffered for years with herniated discs and degenerative disc disease. He has already has 2 total hip replacments and he is on 51. We have 3 young children and we are also struggling to make ends meet, due to his being out of work from his surgeries. I am praying for an end to his suffering and chronic pain. He never complains and works many long hours to provide for me and our children. We both work hard but it seems we always fall behind. We are blessed with healthy children and a very strong marriage. we are very lucky to have each other. I have started the novena to St Gemma - I know she will hear my prayers. Thanks for your kind comments and for sharing a bit of your story. I am sorry to hear of all the back problems that your husband has suffered--that is really a very difficult cross for the both of you to bear. However I am glad to hear that you are making the novena to Gemma. 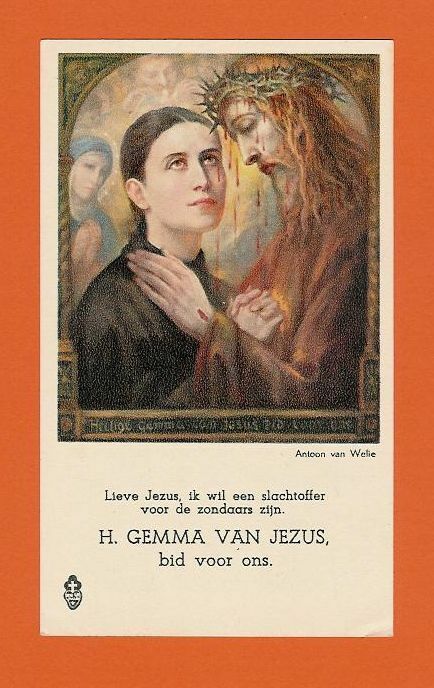 I know that she will help you....I pray that St Gemma may be very, very close to you, and may she obtain strength and courage for you and your husband...and I pray that she may she lead you ever deeper into the Sacred Heart of Jesus. it's me alex. after getting cards of st gemma, i prayed a novena to her. march end i got a job. my first day as a bank clerk was on april 11th. i view it as a strinking god-incidence to be on my job on the first day was on our dear saint's feast day. like you glenn i do have a dear friend in heaven. i love this saint more than all the other saints that i know. Thank you for sharing your story of the intercession of St Gemma in your life---what a truly awesome sign of her help on how you started your new job on her feastday! Once again we can see Gemma's intercession in our everyday lives. -St Gemma, pray for us! I used to work full time helping men coming out of prison find housing, jobs and treatment for medical, mental health and substance abuse issues. Then I became a case manager to help the elderly and disabled adults who were abused and neglected. For the last two years, I have been subsisting on a small disability check that is barely enough to live on. One of my doctors says being on my feet for long periods of time for the work I did caused the arthritis in my feet that sometimes brings me to tears as it is in multiple joints and so bad my left foot looks mis-shapened and deformed in three areas. I can barely get shoes on my feet some days. I also have psoriasis on my feet and scalp that causes my skin to crack, bleed and swell. My hair breaks off and is all different lengths; I have no money for treatment. Yet, I keep remembering the words of one of my clients who told me, due to my compassion and non-judgemental attitude towards the men coming out of prison that I helped "You're saving lives out here." I moved from the city I lived in because my own daughter tried to steal my meager disability check by calling social security and pretending to be me. Now I have no friends and virtually know no one, even after moving to a large city almost a year ago. I have no money to go anywhere, to do anything, to meet anyone, and would be embarrassed and ashamed if anyone knew my plight anyway. I sometimes make a very little extra money freelance writing and often donate the small proceeds to a well-known global crisis agency. I keep hoping that sitting in front of my computer, even though I feel like a hermit, so very alone-or is it lonely(?) will pay off one day. I won an international writing contest for which the only prize was to be published in a magazine that is distributed in many countries, so maybe someone, somewhere will need a writer. Funny how we can be doing so well one day and be suddenly stricken with debilitating illness and poverty that turns our world as we know it upside down. St Gemma and praying gives me strength to carry on and the faith that I will get through this. I posted the last September 24tyh message; I forgot to mention also that although I had absolutely no risk factors, I contracted MRSA 4 times within 8 months,nearly died twice, having to have 2 surgeries at the same time in the summer of 2010 and another double surgery 8 months later. I never fully recovered complete use of my leg and have nerve damage because the MRSA was so deep in my leg. I used to be so healthy, healthier than everyone I knew! I just want to get out of this destitute poverty and be healthy so I can be able to help others again! Thank you so much for sharing the news of St Gemma's extraordinary intercession in your life....truly this is a wonderful grace that you received, thanks be to God. I pray that St Gemma may always be very close to you and your loved ones. I am asking for prayers again. My husband has been unemployed again since November of 2011. I am so stressful also because they are denying unemployment. Please pray that he will find his calling of what we should do. We are from Ohio. I pray that your husband may find suitable employment soon, in Jesus holy Name, AMEN +. I am unemployed and will be evicted from my apartment soon. My daughter and her children are also in the same predicament as me. Please pray for us, we need a job. I always helped the homeless and donated to charity. now I am in their position. so please pray for me. I am praying for both you and your daughter--that you may find work soon. In the holy Name of Jesus, Amen +. 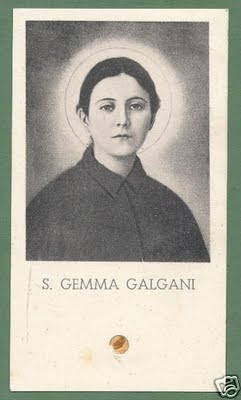 I pray that St Gemma may intercede and help you find a suitable job and may she also obtain light and grace for your husband that he may see his faults and errors. In Jesus holy Name, Amen +. i am living on disability, since i am unable to work my credit is so bad i was turned down for disability housing, my rent takes my entire check. my brother who has been helping me, left his wife now has to pay for his own apt. i don't know how much longer he will be able to help me too. also i need surgery on my ankle have 14 pens and two plates that need to come out but have no health insurance can barely walk. i am so filled with anger have worked all my life and now i can't get medical assistance and get just enough food stamps to barely eat. i am not a christian but i was seaching the internet and i found this site and i felt so at peace as though i would receive the help i need thank u for this site. Prayers are offered for you. Please, for the sake of your mortal soul- believe on the Lord Jesus Christ- Convert now to Traditional Catholicism-Get Baptized, learn confession and make a good 1st confession- then receive Our Lord Jesus Christ in Holy Communion. No matter how much the suffering or the high pile of riches- IT IS ALL TEMPORARY and ETERNITY IS JUST THAT-FOREVER- SO spend this little time preparing for ETERNITY!! I have a "silly" question to ask: I try to get detailed understanding of peoples names. Is "Gemma" pronounced with a "J" sound or a "G" sound like in GOD? Thank You to any who will kindly reply. I stumbled on this page today.I am unemployed and this is my first time coming across St. Gemma.I pray for all those who ask for her favour and equally ask for her grace to look into my situation and help me get a suitable occupation.This i ask through Christ our Lord. I am on disability and live pay check to pay check. I was a proud man, made good money but lost it all, home, car, finances now my wife has become with mental illness. We have been denied by SDA and have been fighting for last 2 yrs with them. ALL seems bleak and dark. It is a struggle to carry on. I give what I can to those begging on street corners, but I don't know if I have the strength to go on PLEASE pray the the saints and GOD help us!!!!! 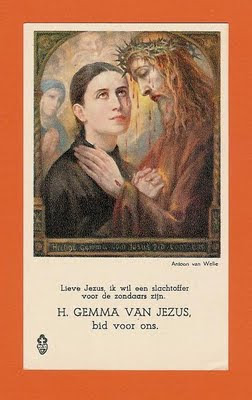 I encountered St Gemma when I looked for the patron saint for students. My part time study for doctorate degree has been very difficult and I have been struggling since 2009. It is nearly the end of the journey, however, it still seems so hard. 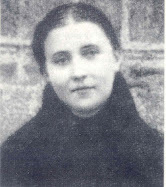 St Gemma please pray for me. When I read further about St Gemma, how I feel so blessed to know that St Gemma is also the patron saint for the unemployed (just like I am) and those who suffers from loosing parents. 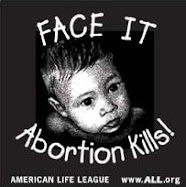 I lost both of my parents (both were non Catholics) and I missed them, however, I just can't express it. I always keep them in my prayers at Mass, with the hope that they may know this the least I can do now for them. Again, please St Gemma pray for me. Thank you Mr Glenn Dallaire for this blog. God Bless. 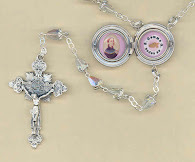 I ask for St. Gemma's intercession. My husband died of unknown colon cancer and left me without. Like her father, he also died at age 57. I have no means of support and also have untreated cancers, ovarian and uterine, for almost a year now. I don't know how I am going to make it. I was a housewife for 32 years and he not only refused to leave any life insurance, even though I had insisted, but he also made us lose everything we had through a 3 year layoff preceding his death. I cannot tell you how much I hate this man who God sent to be our provider and protector, but in the end, wished for bankruptcy and our total destruction and this endless suffering. Please, St. Gemma, intercede on behalf of me and mine and may I ask to receive the miracles that will restore and prosper us, and to heal all of us back to good health, with peace of hearts and minds. I will be so grateful for your intercession. Thank you. I am asking for help and prayers. My husband was forced into retirement at the age of 57. All of his pension money is gone and he is now 62 years old with nerve damage the the prospect of getting a job to help out are bleak. I am working but I don't make enought to cover all of the bills. We met after both our first spouses died of lung cancer at an early age. He is so stressed out and depressed I can barley go home at night and witness his depression. I came across this site while looking for some sort of uplifting stories and hope. Please pray for us and bless my husband. He's a wonderful generous man who even though he can't afford it would give someone the shirt off of his back if it would help someone else. Im asking for prayers for me to get a job to support my two kids and my nephew..st.gemma please help me..
And may God bless you and your loved ones, and draw you ever loser to Himself.